1. THE INTENTION OF THIS POST IS TO SHARE INFORMATION FOR THE BENEFIT OF ALL PEOPLE.PLEASE SHARE IT WITH YOUR RELATIVES AND FRIENDS.MAYBE IT WILL HELP SOMEBODY. 2. I have not added anything from my side. ALL THE SOURCES OF INFORMATION ARE INDICATED SO THAT THE READERS CAN GO TO THE ORIGINAL ARTICLE TO READ HIMSELF/HERSELF. 4. These homeopathic medicines are safe without any side effects, but it is always better if these are used in consultation with the nearest qualified homoeopathic doctor. Index Of Ailments Index Of Ailments An A to Z List of Diseases I have successfully treated using my own version of Homeopathy aka “Joepathy”. An A to Z List of Diseases I have successfully treated using my own version of Homeopathy aka “Joepathy”. Just google Joepathy :You will observe that I mentioned Joepathy above as this is my own form of therapy which is not followed by other homeopaths who will prescribe the Dry dose in pellets. This is NOT as effective as my therapy which gives 100% results. Eupatorium Perfoliatum 200c in the Wet dose is the remedy a teaspoonful taken every hour after succussion of the bottle. before every dose at least 6 times. Eupat Perf 200 in the Wet dose is good for all forms of Dengue. In any case I have proved that Eupat Perf 200 is the Ultimate remedy and I see no reason to deviate from this therapy. All remedies to be used in the Wet dose (see below) taken every 2-3 hours till symptoms pass away which is usually in 48 hours. With High Fever Aconite 200 ,Ice Pack on head is essential. Prophylactic to prevent others catching Dengue ,Gelsemium 30 in the Wet dose taken twice daily. The Platelet count can be stabilized by giving the patient the juice from a freshly cut Papaya leaf. The leaf is crushed in a Blender and a teaspoonful of the juice is give 4 times daily. Or use tablet caripill. If you are infected in your country with the Chikungunya Virus the remedy I have used is: Polyporous Pinicola 200c in the Wet dose taken every 2-3 hours. The patients recovers within 24 hours. Prophylactic to prevent others catching Chikungunya ::Gelsemium 30 in the Wet dose taken twice daily. USE PARACETAMOL 650 to reduce fever. Papaya leaf extract (tablet caripill) raises platelet count but does not cure dengue (the fever and the bone pain). There is no vaccine or preventive drug except homoeopathic medicines. As a preventive: eupatorium perfoliatum 200C , three drops morning and evening for four days. Later once a week till the epidemic lasts. 2. Add ten drops of eupatorium perfoliatum 200C . 3.If patient is serious, than give two tea spoonful from the cup after every ten minutes. If the patient is not serious , than give the medicine after each hour. You can take it alongwith your allopathic medicine also like paracetamol 650 and tablet caripill . 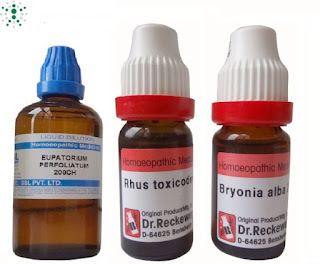 There should be a gap of one hour between allopathic medicine and homeopathic medicine. It is the most suitable remedy for the treatment of Dengue fever as the symptoms of this medicine almost completely mimic that of Dengue fever. It is precisely for this reason that this medicine is called ‘Bone Set’, as it is able to relieve the terrible bone pains that accompany the Dengue fever. It has the same sort of deep bone pains that are almost excruciating in nature. The pain is present in the limbs and the muscles and accompanies a fever which is usually high. There is usually throbbing type of pain in the head. Pain may be felt in the occipital or the back part of the head and also on the top of the head. There is soreness in the eyes or the eyeballs. This medicine also has pains in the whole of the body and the upper as well as the lower limbs along with high grade fever. The pains are usually stitching and tearing sort of pains. The two distinguishing features of this medicine are increased thirst and that the pains and all sorts of sufferings of the patient are aggravated by motion. In fact, motion of any and every sort tends to aggravate the pains in the body and the limbs. Whenever the patient tries to walk or move or even turn in bed, the pains and the suffering become intolerable. He feels better while at rest and does not want to move. There is so much dryness of the mouth, tongue and other mucous membranes that patient wants to drink a lot of water and ends up drinking a lot at one go. The taste of the mouth is bitter. It is one of the best homeopathic remedies for the haemorrhagic dengue fever. There is burning and numbness of the hands, arms and feet. Intense thirst accompanies the fever, so much so that the patient wants to have cold water or even chilled water. Hemorrhage from any and every part or orifice of the body may be seen. The patient may feel unusually hungry. It is indicated by the muscular soreness and pains in the body which are relieved only while in motion. The patient cannot rest as it is the worst position for him. The tongue gets coated white while the tip of the tongue remains red and forms a red triangle at the tip. Carica Papaya is a homeopathic remedy made from papaya fruit. It is a common fruit and its seeds are used to make a homeopathic remedy. It has been seen that it improves the platelet counts in patients whose platelets are falling. The most specific feature to choose Bryonia Alba is worsening of pains by any movement even in the least degree. This Homeopathic medicine is the best remedy when rest is the main position for relief from pain. Extreme thirst with a dry mouth may be felt along with this specific feature. Rhus Tox is the ideal Homeopathic medicine when a patient experiences relief from pain by movement and worsening of pain by taking rest.